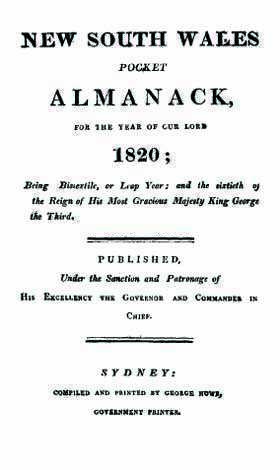 Almanacs are a valuable resource for local, family and social historians as well as for researchers in other fields of Australian history. This New South Wales Pocket Almanac contains information on a whole host of topics such as the public holidays for the year, tide table, kalendar, moon phases, a chronology of English Sovereigns as well as the reigning families of Europe, distances from township to township, even persons in the Civil Establishment and the Military Establishment, as well as details on the rates of labourers' wages, and the costs of various offices. The 'Chronology of Remarkable Occurrences'. This lists world events from 1715 through to 1818, and is useful for putting things in a world context. The 'Chronology of Local Occurrences'. This starts at 1770, and continues through to 1819. Listing events that occurred in New South Wales it covers everything from shipwrecks, floods and executions to openings of orphanages, to when Liberty Plains was named, and coal was discovered at Port Stephens. This is an invaluable genealogy tool for anyone searching their family history or building a family tree.